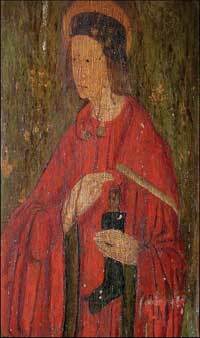 Sir John Schorne was not a canonized saint, but he had a strong local following in Norfolk and royal patronage. His followers asked him for help in the relief of gout and the ague. After a time as vicar of Monks Riseborough he became rector of North Marston in Buckinghamshire in 1290, staying there until his death in 1313. His fame and veneration were the result of his being said to have forced the devil into a boot. He also, during a drought, struck the ground with his staff and a spring (now a well) broke forth. This spring contained a lot of iron compounds, and among other purposes was good against gout - which may have been the devil in the boot! 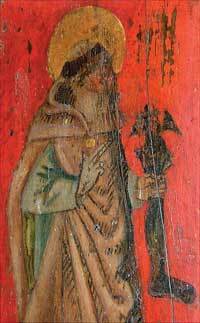 He is depicted on three rood screens in Norfolk, at Gateley, Cawston and Suffield, holding a boot with the devil emerging from its top. From these paintings we can get an idea of the possible appearance of his holy image at the shrine in Binham church. We do not know where in the church the shrine with his image stood. Often the image of the Saint was in the form of a richly decorated statue, and there was a large income to be made for churches with popular shrines. Almost immediately after Edward IV's victory at Tewkesbury, the last Lancastrian King Henry VI was murdered in the tower of London. After a brief exposition in St Paul's, he was buried at Chertsey Abbey away from public view. When a popular religious cult of Henry VI began to flourish, particularly in the north, Edward decided to set up a counter-attraction, and in 1478 the pope gave permission to move the body of John Schorne from the parish church at North Marston to the Lincoln Chapel at Windsor. Pilgrims were provided with small lead badges showing John Schorne, bareheaded, wearing a long robe; in front of him was a long boot with the devil's head appearing at the top. Later his remains were returned to Long Marston where they remained for the next hundred years until the Reformation - at which time the offerings of pilgrims were estimated at £500 a year. Erasmus says that there were nearly as many pilgrims to Long Marston as to Walsingham. 'He also remembered the hollow image erected near St. Alban’s shrine, wherein one being placed to govern the wires, the eyes would move and head nod, according as he liked or disliked the offering; and being young, he had many times crept into the hollow part thereof'. It is thought that the toy “Jack in a box” may have derived from the devil popping out of John Shorne’s boot; could it have been an animated shrine statue?